I did a Kickstarter campaign last month to publish a book my daughter and I wrote together (now available!). I think platforms like Kickstarter are awesome, but only if you know how to use them. There are a lot of amazing stories about creative projects being, well, kickstarted with huge piles of funding thanks to Kickstarter. But you don’t hear the stories of all the failed projects that didn’t quite get there. You need to have a clear, simple description of the project you’re going to do. Give us details: Who are you, why are you the person to create this, why is it worth doing, why do you need Kickstarter, etc. I’m shocked at how many people just throw up an idea and expect money to pour in. Doesn’t work that way. Show me what you’re going to do and how you’re going to get there. You should put enough sweat into the project before Kickstarter that I can see it coming to life. I’m investing in an idea. I’m not investing in you coming up with an idea. Keep your goal realistic. If you don’t hit your goal you get nothing. But you can always go over your goal. What’s the bare minimum you’d do this project for? That’s your goal. Don’t put in lots of extra cushion room. Keep that goal attainable. The goal for The Stephanies was $300 in 30 days. Easy. Also, keep that time frame short. 30 days should be the max. 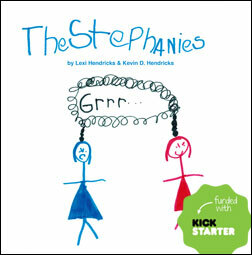 We hit our goal for The Stephanies in three days. Rewards are huge, but easy to do wrong. Keep the rewards simple and don’t offer too many. Don’t make me choose rewards because one has the format I want and one doesn’t. Also, make sure they’re packed with value—these are your early supporters, willing to back you when no one else will. So treat them like insiders, not donors to milk. It kills me when I see Kickstarter projects I’d love to back but they’re asking $25 for an ebook. Seriously? I promised my backers they were getting the cheapest possible price. Be sure to offer something awesome for $1. My most popular reward was the digital copy for $1. It brought in the least amount of money but the most people (build your audience!). It builds a buzz and lowers the cost of entry. Also offer some cool high-end prizes. Well over half our income came from the $50 and up rewards. This is a way to reward your uber-fans with some cool stuff. Your video is important. Everybody talks about this, but I think it’s over-rated. Do a good job with the video, make it professional and tell your story. But if that’s you sitting in front of the camera, don’t sweat it. Kickstarter is awesome. If you do it right. Do you have a project needing a kickstart?